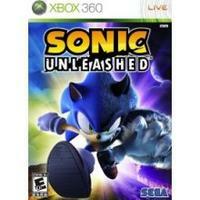 Sega's speed-loving mascot returns to foil another evil plot in Sonic Unleashed. This time, Dr. Eggman has caused a catastrophic event that shattered the world into many pieces, and gamers must guide the spiky-haired Sonic on a quest to reunite the planet. The cataclysm also brings about an unexpected change in Sonic, and in order to find the lost chaos emeralds and reconnect the world's continents, players must master both his traditional daytime abilities, and the new nighttime abilities of his slower and stronger alter ego Sonic the Werehog. Sonic Unleashed makes use of a new "Hedgehog Engine" designed to give the game an unparalleled sense of speed and provide smooth transitions between the 2D and 3D sections of each daytime level. As always, players collect rings as they reach supersonic levels of speed, making use of the "Quick Step" and "Speed Drift" abilities to avoid obstacles and handle corners without losing momentum. There are nine game worlds, all designed to resemble real places such as Greece, China, and New York City, and each of the worlds features branching pathways and multiple routes to the finish line. Other familiar characters from the franchise, such as Tails, Knuckles, and Amy Rose, make appearances in a number of optional mini-games that offer a break from the high-speed action.